While the use of antiarrhythmic agents to suppress atrial arrhythmias (atrial fibrillation and atrial flutter) is still in practice, it is unclear whether suppression of atrial arrhythmias will prolong life 1,2. In the past, it was believed that supression of the potentially dangerous ventricular arrhythmias, ventricular tachycardia and ventricular fibrillation would prolong life, but it was found in large clinical trials that suppression of these arrhythmias would paradoxically increase mortality 3,4. In individuals with ventricular arrhythmias, antiarrhythmic agents are often still in use to suppress arrhythmias. In this case, the patient may have frequent arrhythmic events or at high risk for ventricular arrhythmias. Antiarrhythmic agents may be considered the first-line therapy in the prevention of sudden death in certain forms of structural heart disease, and failure of these agents to suppress arrhythmias may lead to implantation of an implantable cardioverter-defibrillator (ICD). The antiarrhythmic agents are classified based on what portion of the action potential they directly affect, and which ion channels of the cardiac myocyte they interact with. Class I agents interfere with the Na+ channel. Class II agents are anti-sympathetic agents. All agents in this class are beta blockers. Class IV agents affect the AV node. The class I antiarrhythmic agenst interfere with the Na+ channel. Class I agents are grouped by what affect they have on the Na+ channel, and what affect they have on the cardiac action potential. Class Ia agents block the fast sodium channel. Blocking this channel depresses the phase 0 depolarization (reduces Vmax). 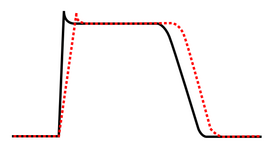 This prolongs the action potential duration by slowing conduction. Agents in this class also cause decreased conductivity and increase refractoriness. Class Ia agents include quinidine, procainamide, disopyramide, and moricizine. Class Ib antiarrhythmic agents are sodium channel blockers. Class Ib agents have fast onset and offset kinetics, meaning that they have little or no effect at slower heart rates, and more effects at faster heart rates. Class Ib agents shorten the action potential duration and reduce refractoriness. These agents will decrease Vmax in partially depolarized cells with fast response action potentials. 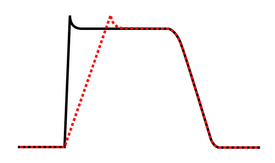 They either do not change the action potential duration, or they may decrease the action potential duration. Class Ib agents include lidocaine, mexilitine, tocainide, and phenytoin. 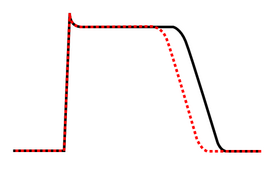 Class Ic antiarrhythmic agents markedly depress the phase 0 repolarization (decreasing Vmax). They decrease conductivity, but have a minimal effect on the action potential duration. Class Ic agents are indicated for life-threatening ventricular tachycardiac or ventricular fibrillation, and for the treatment of refractory supraventricular tachycardia (ie: atrial fibrillation). Class Ic agents include flecainide and propafenone. Class II agents are conventional beta blockers. They act by slowing conduction through the AV node. Effect of class III antiarrhythmic agent on cardiac action potential. Class III agents predominantly block the potassium channels, thereby prolonging repolarization5. Since these agents do not affect the sodium channel, conduction velocity is not decreased. The prolongation of the action potential duration and refractory period, combined with the maintenance of normal conduction velocity, prevent re-entrant arrhythmias (The re-entrant rhythm is more like to interact with tissue that has become refractory). Class III antiarrhythmic agents exhibit reverse use dependent prolongation of the action potential duration (Reverse use-dependance)5. This means that the refractoriness of the ventricular myocyte increases at lower heart rates. This increases the susceptability of the myocardium to early after-depolarizations (EADs) at low heart rates. At low heart rates, class III antiarrhythmic agents may paradoxically be more arrhythmogenic. Class III agents include amiodarone, sotalol, dofetilide, ibutilide, and bretylium. Amiodarone is indicated for the treatment of refractory VT or VF, particularly in the setting of acute ischemia. Sotalol is indicated for the treatment of atrial or ventricular tachyarrhythmias, and AV re-entrant arrhythmias. Class IV agents are slow calcium channel blockers. 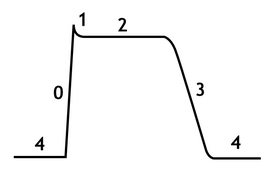 They decrease conduction through the AV node. Clas IV agents include verapamil and diltiazem. Class V agents include adenosine and digoxin.